Think back to when you were a kid in elementary school and there was something you really wanted. You might have asked for it on your birthday, had it on your list to Santa or some other special occasion. It could have been a special trip, an activity or a thing you were just dying to have. For me it was a Schwinn Varsity Sport ten speed bicycle. The year was 1967, I was 12, and had just moved across the country from Washington DC to Spokane Washington the previous summer. I wanted that bike more than anything. The bike was about $75 and I had no money and no real means to earn money. These days, Baby Boom parents would have bought their son the bike just for having made the move with the family. Not so my dad. As a Navy Commander and combat pilot he expected discipline in his troops and his children. No amount of pleading, begging or similar tactics would sway the Commander. His only suggestion was that I find a way to earn some money. One Saturday morning I was reading through the classified section of the local paper and came across an advertisement looking for a paperboy. To be precise, someone was looking for a newspaper carrier. In those days most towns of any size had a morning and evening paper. The position advertised was for the Spokane Daily Chronicle, which was the evening newspaper. The Commander gave the green light for me to inquire about the position. I called the number and the woman I spoke with made an appointment for the carrier supervisor to come by and visit with me and my parents one day after school. During the meeting which followed a few days later, he reviewed the job requirements with the three of us. At the end of the meeting I remember signing a document and more importantly my dad signing the same paper. Looking back now I realize that it was a contract making my parents accountable for the papers and money I would be dealing with. It’s a bit late now, but I really do appreciate them having done that, as it provided my introduction to small business in America. At the tender age of twelve I had landed my first job and it wasn’t just any job, I was an independent contractor for the Spokane Daily Chronicle. I was on my way. Prior to starting my professional career following college, I held several positions that had significant elements of dealing with the public at the retail or service level. The lessons learned dealing with customers in a retail environment provides valuable skills that help you work with people for your entire life. It is, to a certain extent, a badge of honor. With such badges come the battle scars from the lessons learned. The scars, pain and joy from lessons learned serve to define who we are. Me? Heck, I was just a kid who wanted a bike. The lessons learned were a bonus I did not recognize until many years later. The whole experience of desperately wanting a bike and finding a job to pay for it took place during a little over a year’s time. 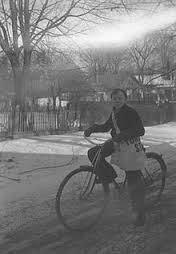 The Schwinn’s made at that time were of excellent quality and I still have that very same bike in my garage today. I still ride the bike. I put such an emotional effort into the process of buying that bike that I have never been able to part with it. The bike traveled with me to college and following college to career locations in the states of Washington, Indiana, Connecticut, Texas, Colorado and Idaho. I completed a sprint distance triathlon in 1994, and rode the Schwinn on the bike portion. Boy did I get the looks as people passed me on their carbon-fiber $5,000 bikes! As a consumer, it’s by far the best and most memorable purchase I have ever made. I just may be buried with that damn bike! This entry was posted in Family, Personal Finance and tagged family, musings, newspaper carrier, paperboy, personal finance, writing on January 8, 2014 by Terry.